Do you need to make changes to products that you've already uploaded to Wish? Using the Edit Products tool, you can edit your product's attributes such as price, shipping, quantity, and more. 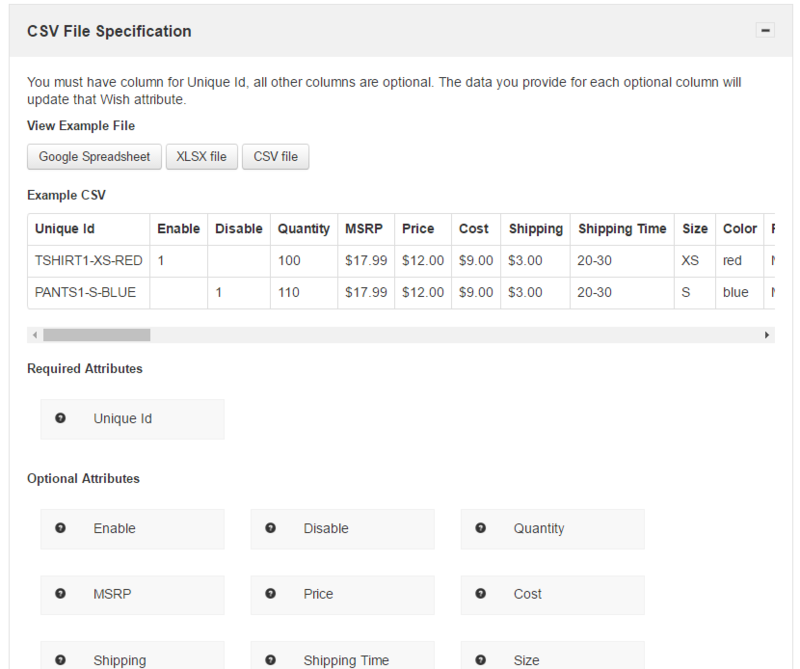 First, create a simple .csv product feed file. You must include the Unique Id (or SKU) for each item you wish to update. This goes in the Unique Id column. This column is required. Then, add columns for the attributes you need to edit. You can include as many columns as you need, depending on the Unique Ids what you want to update. Once the feed is created and saved as a .csv, go to 产品 > 更新现有产品 > 产品 CSV 文件. This page provides helpful information about uploading. Under Feed Specification, you can click on any attribute for more information. When you're ready to upload your feed file, scroll down to Upload Your Feed File. Select your file and click Submit. You can update any attribute exactly this same way. Just switch out the "Quantity" column for a column with another one of the Optional Attributes as the title of the second column (make sure to always include the Unique Id column!) and input the relevant information. What if you want to edit inventory for some products, but you also need to change the shipping cost and price for some? You can do it all at once. Start with the required Unique ID column and then go on to add as many attributes (columns) as you need. After you're finished creating the feed, go to 产品 > 更新现有产品 > 产品 CSV 文件, select your file, and click Submit. That's it!